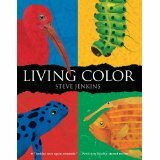 Summary: This is a book that shows the colors that many living creatures use each and every day in the wild. Some of animals use colors for survival: camouflage, attracting a mate or just plain warning others “DO NOT TOUCH! !” Others use them for establishing who is boss in the area or group. In all of this the animals use the colors they have in many and various ways to get by in the world around them. The colors used in this book are red, blue, yellow, green, orange, purple, and pink. Colors red through green are given four pages each while the colors orange though pink are given two pages for explanation of how the color is used for the animals listed. The animals are various: land animals such as the three toed sloth are in this book with flamingos, green moray eels, and yellow crazy ants. At the end of the book there is a bit more about how color is used and even a section for each animal is specifics of size, habitat and diet. Literary Elements: This is an information picture book. Each animal is illustrated very well and given a short description of how they use their color. Information is short and to the point with some fun details thrown in occasionally. Race/Gender/Culture/Economics/Ability: This could be used to tie the differences of the animals to the corresponding differences among humans. It can also start a discussion of size and ability not necessarily corresponding in the different animals. Theological Conversation Partners: While not theological in any form, this book can open a conversation about the care of God’s creation and what happens when that care is not taken. There are some animals which the book lists as endangered due to loss of habitat. There are others that have moved to new places where they can wreak havoc due to having no natural predators to keep them in check. The question of how to care for this world God entrusted to us is the major theme to be found here. What did you notice first about the different animals and their colors? What are some of the problems for animals if their habitat is destroyed? Some colors in animals are based on their diet. What might happen if something changed in that diet? How can habitats be secured or strengthened? Why should care be taken to insure animals are not endangered? How can we help take care of God’s creation? Living Color by Storypath is licensed under a Creative Commons Attribution-NonCommercial 4.0 International License.